Disclaimer: This website is a brochure describing the vision for a monastic community. This community does not exist in real time. There is no connection between this "community" and an existing Benedictine congregation or canonically established community or to any diocese. 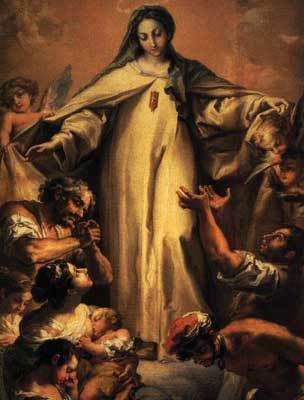 On July 4, 1843, Francisco Diego Garcia y Moreno, first bishop of the Californias (Alta and Baja), proclaimed Our Lady of Refuge as patroness of the Californias. Now, 175 years later, a California native and Benedictine Oblate strives by the grace of God's gracious Providence to bring into being a new contemplative Benedictine community of monks under this same Patronage of the Blessed Virgin Mary, refuge of sinners. The desired location for this new monastic foundation is the lush redwood covered hills of the Santa Cruz Mountains situated along the central coast of California. Change of Plans: An announcement. The traditional Benedictine choir habit is the normal attire and a simple "work habit" (hooded smock) is worn when appropriate. We rarely wear secular clothes. Latin Gregorian Chant is sung at all liturgical functions according to Vatican II norms. The Liturgy of the Hours (Divine Office) is celebrated in common seven times each day: Vigils (Night Office of Readings) takes place before dawn, and the hours of Lauds, Terse, Sext, None, Vespers, and Compline are sung at appropriate times throughout the day. The Holy Eucharist is celebrated each day according to the Roman Missal (Third Typical Edition in English) with the Latin Gregorian Chants sung from the 1979 Graduale Romanum. The life of worship, prayer, study, and manual labor take place within the Monastic Enclosure as directed by the Rule of Saint Benedict. We do not engage pastoral work, and do not leave the monastery grounds unless demanded by necessity or business. Hospitality is extended to monastery guests in a suitable manner outside the Enclosure. A balanced life in common strives to foster fraternal charity within the context of traditional monastic customs: scheduled periods of silence, daily lectio divina (spirtual reading), private prayer, spiritual conferences, work, and recreation. Is God calling you to be a monk? Unmarried men between the ages of 25 and 35 who are practicing Catholics at peace with the Church and are discerning a call to monastic life are invited to study the information provided on this website before making contact. Is God calling you to help build His house? Land in rural San Mateo County is required in order to establish Our Lady of Refuge Monastery. Anyone who owns some agricultural acreage suitable for this purpose, or would have the funds available to purchase such property, please contact the webmaster via the Email address provided below. Joseph the Benedictine: Monastic Musings. Please become a "patron" by visiting our Patreon account.